Users with the appropriate permissions can edit existing well tests. To edit a well test: Open the Data Entry tab of the field that contains the well to be edited. Navigate to the Well Tests section of that tab. Right-click on the well test that needs to be edited and select QC All Tests for this well. Edit values in a well test or delete it entirely. To edit values in a well test: Click on the cell that needs to be edited and enter the value. To delete a well test: Right-click on the well test to be removed and select Delete Well Test. 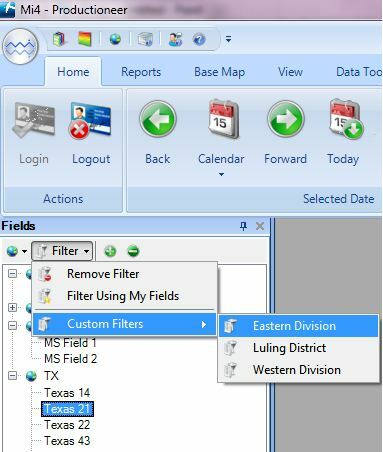 The filter option allows you to customize the fields displayed in the ‘Fields’ Pane. 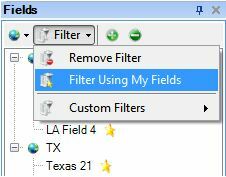 To create a filter: Click Filter located at the top of the Fields pane. 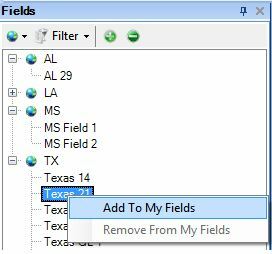 The dropdown menu allows you to filter the fields based on custom filters or the My Fields list. There is a Filter Using My Fields option that will only display the fields in the My Fields list. To add a field to the My Fields list: Right-click the name of the field and choose Add to My Fields. When a field is added to the list, it is marked by a yellow star. 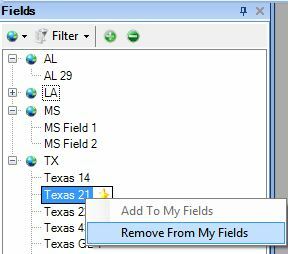 To remove a field from the My Fields list: Right-click the name of the field and choose Remove from My Fields. Sometimes you might need more screen space to view large reports. One way to do that is to autohide (or minimize) the ribbon. When it is minimized, the ribbon tabs will still be visible and clicking on a tab will automatically display its corresponding ribbon page. If you click on a button or move your mouse away, the ribbon will automatically hide again. To hide the ribbon, you can double-click on a tab or use the right-click menu to select Minimize the Ribbon. To bring back the Ribbon, right click on a ribbon Tab then uncheck Minimize the Ribbon. Do you have two monitors? Productioneer will automatically take advantage of your entire desktop space with one simple click. 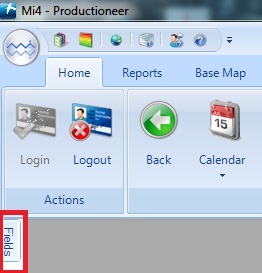 All of the panels in Productioneer (Fields, Reports, Information, etc.) are equipped with an auto-hide feature that hides the panel out of the way while not in use. To activate auto-hide, unpin the pushpin on the top right corner of the panel. When a Panel is hidden, clicking on its title will bring it temporarily into view. To keep the panel from auto-hiding (pinned), click the push pin again. If the ribbon is taking up too much space on your screen, you can switch to the dropdown menus by using the Small Icons button under the VIEW Ribbon Menu. 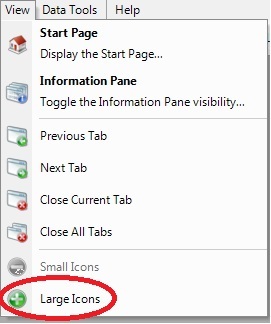 To switch back to the ribbon, use the Large Icons menu option under the View dropdown menu.